Substitute Andre Ayew scored a second-half equaliser to earn West Ham a Premier League point against Watford. Just three minutes later they could have doubled their advantage but M'Baye Niang's powerful drive flew narrowly over the crossbar. The game was held up for a lengthy period just before half-time when Watford's Zarate went down with a knee injury. He was taken to hospital for a scan to determine the extent of the problem. Watford goalkeeper Heurelho Gomes brilliantly kept out Jose Fonte's header with a full-stretch save, before Michail Antonio's low shot struck both posts and Ayew was on hand to tuck in the rebound. Hammers midfielder Antonio was dismissed with five minutes to go after receiving a second yellow card for deliberate handball. The result moved both sides up a place in the table. The Hornets climbed to 12th, while the Hammers go ninth. Slaven Bilic's side had fallen behind early in the game, but showed their fight by continuing to push forward and getting their reward in the second half to gain a point. Striker Ayew came off the bench to claim just his second goal in a Hammers shirt as the ball kindly fell to him inside the box following Antonio's effort. 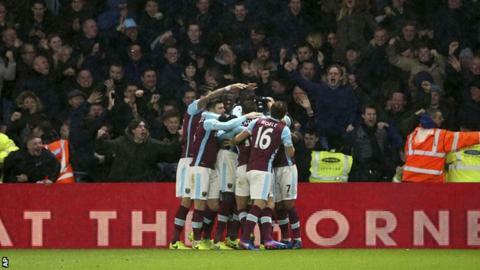 It was Ayew's 14th Premier League goal and the the Ghanaian has now netted against 13 different teams in the division. Having hit the woodwork, former Nottingham Forest man Antonio should have got on the scoresheet but headed narrowly wide from close range after Aaron Cresswell's cross. His unfortunate match got worse late on when he was given the first red card of his professional career. Deeney's spot-kick was his fourth goal in his past five games and Watford's only shot on target in the entire match. Since the start of last season, Deeney has scored nine penalties, the joint highest tally with Tottenham's Harry Kane. If they failed to trouble West Ham goalkeeper Darren Randolph after the penalty, it looked like the Hornets might at least hold out at the other end, but Walter Mazzarri's side now have just just one clean sheet in their past 16 games. They could even have snatched a win in injury time, but substitute Isaac Success was not able to get any contact on Deeney's knock-down in the box. Watford had Argentine Zarate - who won the penalty - taken off on a stretcher after appearing to twist his knee in the first half. West Ham manager Slaven Bilic speaking to BBC Sport: "Considering we were in good form and how well we played today, especially in second half, it's two points dropped. "On the other hand, considering we are playing away against a good team and we conceded an early goal, there's always a danger you will concede a second then you can lose the game. "If you ask me which team today showed more quality in every department, especially on the ball, that was [us], especially in the second half. I told the guys we have to give them some credit." Watford manager Walter Mazzarri speaking to BBC Sport: "I saw Mauro Zarate in a lot of pain. Unfortunately it is not a good sign. He was also making a lot of difference on the pitch. Hopefully it is not too bad. He was making a difference on the pitch. "If we speak about the game, I didn't like how we went down in the second half. "We also commit some silly mistakes that we can avoid. It's not acceptable to allow them a goal on counter-attack when you are winning 1-0. The injury didn't allow me to make all the substitutions I wanted. "This is our first season and this season is to grow, to prepare and to grow. Year by year the objective is to make the next step forward." Troy Deeney has scored nine of his 21 Premier League goals from penalties (43%). Watford have kept only one clean sheet in their past 16 Premier League matches. Jose Holebas picked up his 12th yellow card of the season in this match - more than any other Premier League player in 2016-17. West Ham have now lost just one of their past seven Premier League away games (won three, drawn three, lost one). Andre Ayew's goal was the 100th scored in the Premier League for West Ham under Slaven Bilic. Watford host Southampton in the league next Saturday (kick-off 15:00 GMT), while West Ham face Chelsea on Monday, 6 March (kick-off 20:00 GMT). Match ends, Watford 1, West Ham United 1. Second Half ends, Watford 1, West Ham United 1. Attempt missed. Troy Deeney (Watford) header from the centre of the box is close, but misses to the right following a corner. Attempt blocked. Miguel Britos (Watford) left footed shot from the centre of the box is blocked. Assisted by José Holebas. Corner, Watford. Conceded by Cheikhou Kouyaté. Substitution, West Ham United. Edimilson Fernandes replaces Manuel Lanzini. Corner, West Ham United. Conceded by José Holebas. Corner, Watford. Conceded by Winston Reid. Second yellow card to Michail Antonio (West Ham United) for hand ball. Hand ball by Michail Antonio (West Ham United). Substitution, Watford. Isaac Success replaces M'Baye Niang. Valon Behrami (Watford) wins a free kick in the defensive half. Offside, Watford. Etienne Capoue tries a through ball, but Troy Deeney is caught offside. Goal! Watford 1, West Ham United 1. André Ayew (West Ham United) left footed shot from the centre of the box to the bottom right corner following a fast break. Michail Antonio (West Ham United) hits the left post with a left footed shot from the centre of the box. Assisted by Manuel Lanzini following a fast break. Attempt missed. Manuel Lanzini (West Ham United) right footed shot from outside the box is too high. Assisted by Michail Antonio. Foul by Valon Behrami (Watford). Attempt missed. Michail Antonio (West Ham United) header from the centre of the box is close, but misses to the right. Assisted by Aaron Cresswell with a cross. Attempt blocked. Manuel Lanzini (West Ham United) right footed shot from outside the box is blocked. Assisted by Mark Noble. Tom Cleverley (Watford) is shown the yellow card. Foul by M'Baye Niang (Watford). Foul by Miguel Britos (Watford). Substitution, West Ham United. André Ayew replaces Robert Snodgrass. Cheikhou Kouyaté (West Ham United) is shown the yellow card for a bad foul. M'Baye Niang (Watford) wins a free kick on the left wing.